Includes 2 Tests for: Iron, Copper, Chloride, Nitrate/Nitrite Nitrogen, Total Chlorine, Total Hardness, Free Chlorine, Sulfate, pH, Total Alkalinity, and Hydrogen Sulfide. Includes 1 test for Bacteria. BACTERIA CHECK REQUIRES NVF-4 UV LIGHT SOLD SEPARATELY. 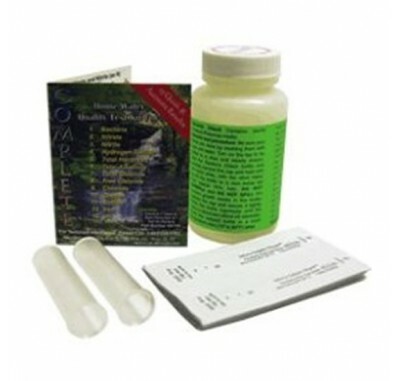 The Sensafe 481199 test kit measures for Bacteria, Nitrates, Nitrites, Hydrogen Sulfide, Total Hardness, Total Alkalinity, Total Chlorine, Free Chlorine, Chloride, Copper, Sulfate, Iron, & pH. The Sensafe COMPLETE Test Kit gives the user rapid and comprehensive results.